Automobile repair shops can offer general repairs and thus offer a wide variety of mechanical services, from engine repair to tune-ups. 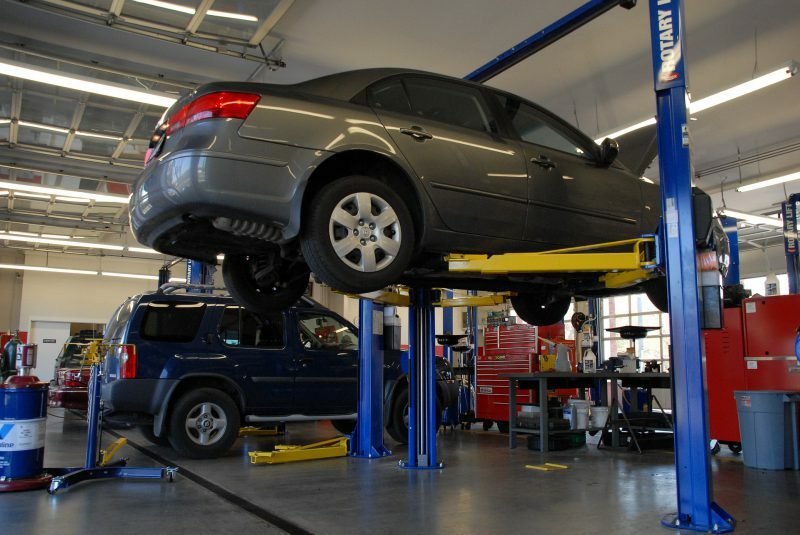 Or they may specialize in a specific type of repair, such as transmissions or brakes. Normally, auto repair shops do not specialize in body work or painting operations, but they will perform those necessary and incidental to repairs. Other operations may include the retail sales of automobile accessories or maintenance items and tools. Some are a part of a gasoline or diesel fuel sales operation, and some auto repair facilities are a part of an automobile dealership. Additional services can include towing, auto club affiliations, pickup and delivery of customers, and the loan or rental of replacement vehicles. Some will have a mobile unit to perform repairs to stranded vehicles or at the customer’s location. Property exposure from fire comes from the oils, solvents, or other flammables, which must be properly labelled, stored and separated. Welding exposures are often a part of the operation and need to be evaluated for proper handling of the tanks and gases, as well as adequate separation from the other operations with either a separate room or flash/welding curtains. Inland marine exposure comes from goods in transit. Employees will run errands to pick up various needed items and transport them back to the operations. Values will vary, based on parts needed. The radius will also vary but tends to be local. Crime exposures are from Employee Dishonesty and money and securities. All ordering and inventory control should be handled by different individuals in order to have adequate checks and balances. There should be inventory control procedures in order to prevent employee theft. Cash should be maintained by a cashier with money regularly deposited. Occupier’s Liability exposure is from slip and falls by customers. There is also the attractive nuisance of cars in the parking lots. Customer waiting areas should be provided and customers must not be permitted in the garage area. Lots should be well lighted, with chains in place to prevent entrance after hours. Products liability concerns stem from vehicles that are not properly repaired. Check-off procedures should be in place. Environmental impairment exposures exist from the disposal of used oils, solvents and other hazardous wastes. Disposal procedures need careful review. Automobile liability exposures are from errand running to pick up needed supplies. All drivers should have valid licenses and their MVRs regularly checked. If towing takes place, a more serious exposure exists. All tow drivers must be experienced in towing. Vehicles must be regularly checked, in particular the hoists and tow bars. Garagekeepers exposure comes from the physical damage losses to customers’ vehicles while in the repair shop’s care, custody and control. Lots must be well lighted and chains in place to prevent transport. Fences and other security may also be appropriate. Workplace safety exposures come from injury while lifting the vehicle or during the use of hoists. Other non-mechanical lifting exposures could result in back injury, sprains, strains or hernias.